Pericardial effusion - What is it? Pericardium, or cardiac sac, is the double-walled sac of connective tissue, which completely envelops the heart. The heart wall of the cardiac sac is grown together with the heart muscle and is called the epicardium or the outer skin of the heart. 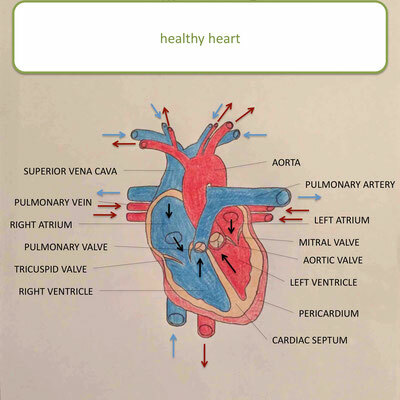 The external wall of the cardiac sac (also called pericardium) consists of firm connective tissue and adipose tissue, and is fused with the diaphragm as well as the pleura, whereby the cardiac sac is fixed in its position. Between epicardium and pericardium is the pericardial cavity, which is filled with a small lubricant film of clear liquid to allow the beating heart to beat easily and with low friction. This lubricant is generally not presentable during ultrasound. 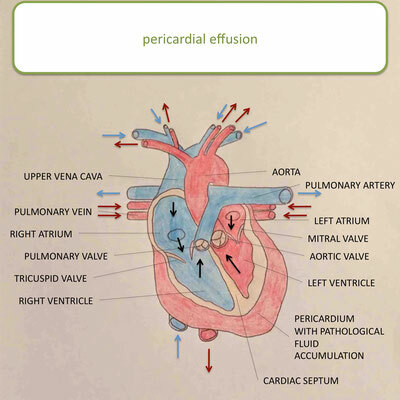 A pericardial effusion or cardiac sac effusion is characterized by a pathological accumulation of fluid (for example, in the form of blood) in the cardiac sac which presses on the heart muscle and thus prevents it from filling properly with blood. As a result, backlog symptoms can occur in the abdominal cavity or chest. As a result, a severe drop in blood pressure and congestion in the chest can cause a shortness of breath. A pericardial effusion is therefore clearly a life-threatening disease and should be recognized and treated as quickly as possible. A pericardial effusion can occur in all age groups, but occurs frequently in dogs from a middle age. 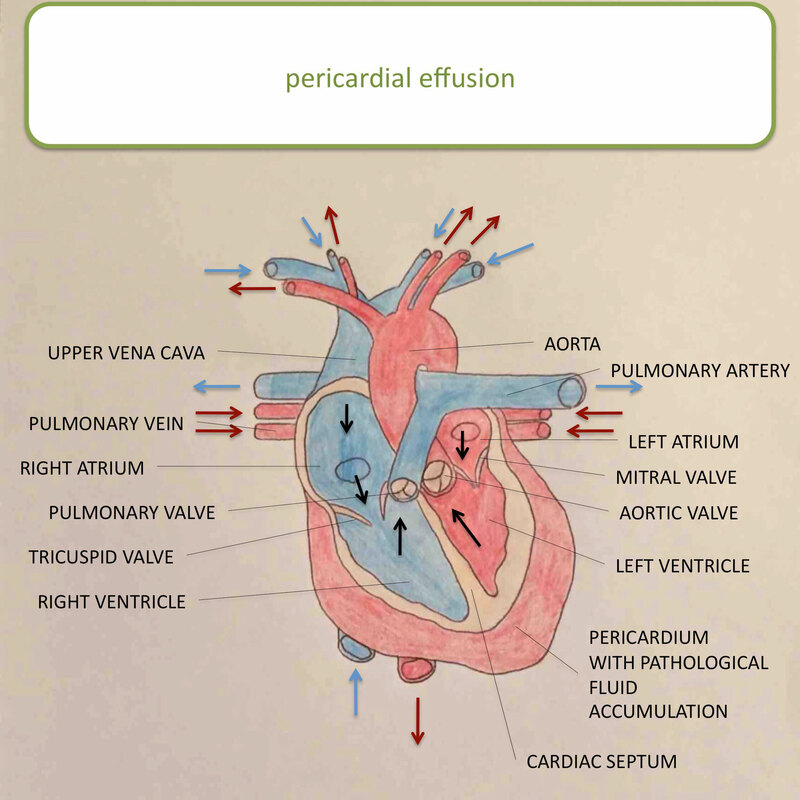 Which forms of pericardial effusion do exist? In 90% of the cases, the pericardial effusion is an idiopathic disease or caused by tumors. The exact cause of an idiopathic pericardial effusion has not yet been clarified. Inflammatory processes are assumed to be probable, but this is not certain. This form of the pericardial effusion frequently occurs in large dogs, mostly in middle-aged male animals. The accumulation of fluid in the idiopathic pericardial effusion is shown as a sterile and usually bloody effusion, which usually accumulates over an extended period of time, and in this way the pericardium usually extensively expands. For a tumor-dependent pericardial effusion, which usually occurs after 6 years of age, mainly 3 types of tumors are responsible. In most cases, bleeding or ruptured tumors in the right atrium are the cause of such effusions. Usually, these tumors are of malignant nature. The internal bleedings often occur so fast that the pericardium can not be stretched, whereupon the right atrium is suddenly compressed and the blood flow to the heart suddenly becomes worse. Circulatory collapse or even a relatively sudden death may result. Hemangioma sarcomas are tumors from the vascular system, which can also metastasize into the liver, spleen, lungs and kidney. Cardiac tumors are usually slow-growing, usually benign tumors, which, however, often result in congestive symptoms. Mesotheliomas are difficult to diagnose, relatively rare and diffuse growing connective tissue tumors. In addition to inflammatory processes and tumors, traumas or coagulation disorders sometimes play a role in the development of pericardial effusions.